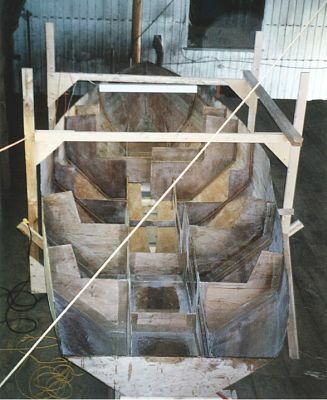 Once the inside of the hull had been fully fibreglassed and sanded I was ready to begin the process of permanently installing the stringers and frames that make up the interior structure of the VG23. Before any of them could be glassed in place their shape needed to be tweaked to ensure that they would sit properly. It’s important to avoid any hard spots which are places where the frames put pressure against the hull. Otherwise the localized stress in these areas could cause problems down the road. With each member of the structure I ran the table saw or jig saw around the edges, taking off about a 1/8″ to 1/4″ sliver. I would then test fit them in their specified locations within the hull, using the grinder and occasionally the jig saw to adjust the shape. All hard corners on the framing were rounded out to fit the curves of the hull seams. This procedure was a tiny bit awkward with the long stringers which tended to want to slip ahead. Because their length and flex made them clumsy to remove from inside the hull to be worked I made most of the adjustments in-place. Once I was happy with how each member fit I gave them a thin coating of epoxy, being sure to touch the edges of the plywood as well. Naturally I was eager to run the sander over each once they’d fully cured. I mentioned during the process of shaping the hull that I had managed to fit most of the interior members together without having to cut them into pieces so that was how I placed them in the hull for the final time. Begining in the cockpit I tabbed the stringers and then the frames to the hull with an epoxy / sawdust putty. I would glue the members in a few strategic locations to hold things in place, again using an occasional temporary screw to keep things from shifting while the glue hardened. Finally, I built the fillets and applied the required fibreglass tape as specified in the lamination schedule of the plans. Similar to the procedure I’d used to apply the tape to the hull seams I would build a few fillets and while they began to cure I cut and wetout the fibreglass tape on the workbench. The wetted fibreglass tape was then applied to the seam and worked with the squeegee. By this point I was quite comfortable with the process and was able to make good progress considering the number of seams that need to be glassed. I’ve actually been delaying the writing of this dispatch as it will unfortunately be the last covering the first season of building. As I write the VG23 is sitting in the hayloft as you see her above (nearly), wrapped up tightly in a few tarps. I’m anxiously awaiting the warmer weather that spring will bring in order to get back into the loft. A few foks have let me know that they are reading these accounts and I want you to know that they will pick up once work resumes. You can expect the picture count to increase as well. If you have any specific questions about building the VG23 I would love to try and help answer them. I do suggest that maybe we try and keep the technical discussions to the bateau2.com builder’s forum so that those who follow us can more easily benefit from the conversation. Besides there are a number of folks there who actually know what they’re doing and would love to help out ;-). That’s where Jacques Mertens, the VG23’s designer, reads and answers questions like a champ. He is very giving with support and his advice and explanations are always pearls of wisdom. Andrew, How many manhours have you invested to this point. I think the plans call for approximately 500 hours. Based on your effort so far does that look realistic to you? Man, that’s a good question Steve. A very rough guess would probably put it around 200 hours to date. Will I spend more than the 500 estimate? No doubt. I’d say 500 is possible for someone who knows a little bit about what they’re doing and building pretty simply. FWIW, I expect to come in over budget cash wise too. Though that aspect is probably more variable depending on various regional and ecomonic factors. I plan on starting a couple of spreadsheets when I start mine to track manhours and costs. When I start looking a things like winches, gps, sonar, hatches, portholes I can see that this is going to be a lot more than what I initially thought but I can wait. Your boat looks great, what’s next to do? If I recall correctly you were ironing out some building space details – is that sorted? I’m sure I’ve said this before but be sure to keep us informed as things take off. I have found a tent (10X27) that I will put in my driveway for the construction period. If I retire next spring then I hope to be in the water by August. That’s 500 manhours starting from April. I plan on ordering the precut kit so that should save me a week or two. Have you done you electrical plans yet. I was pricing the cost of DC and AC panels for boats, battery charger, battery. Seems like everything I want to by is $200.00 each. Even the fresh and gray water tanks for under the cabin bunks are $99.00 each. I an going to change the cabin layout a little and put the sink and stove on the port side aft. That will shorten the bunk on the port side to less than four feet but I don’t expect any overnight guests and If so I’ll rig a hammock from aft starboard to port forward. I have read some good books on this subject in the last few weeks: Sailboat Electrics, Simplified, Don Casey; Boat Interior Construction, Michael Naujok; Boat Joinery & Cabinetmaking Simplified, Fred Bingham; Building with Plywood, Glen Witt. BTW looks for parts at http://www.defender.com (I ordered a catalog online). Great Stuff and you learn a lot just by reading the descriptions. Just one more book I forgot to list above. I know you said that you don’t have a lot of sailing experience so you might be interested in “Sailing Fundamentals”, Gary Jobson. It is an easy read and everything about sailing and sailboats starts to make sense.